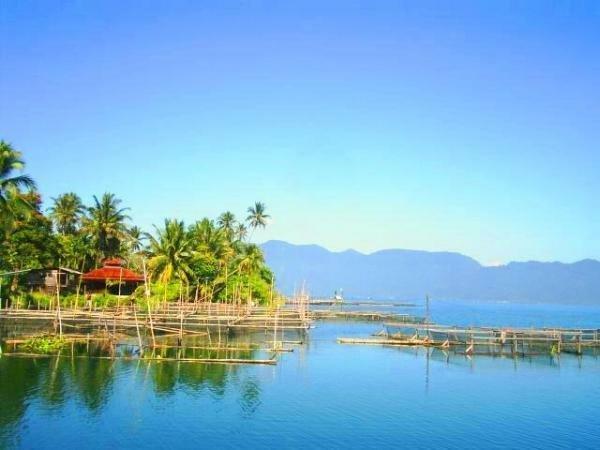 Danau Maninjau is the most famous lake of visit in West Sumatra. 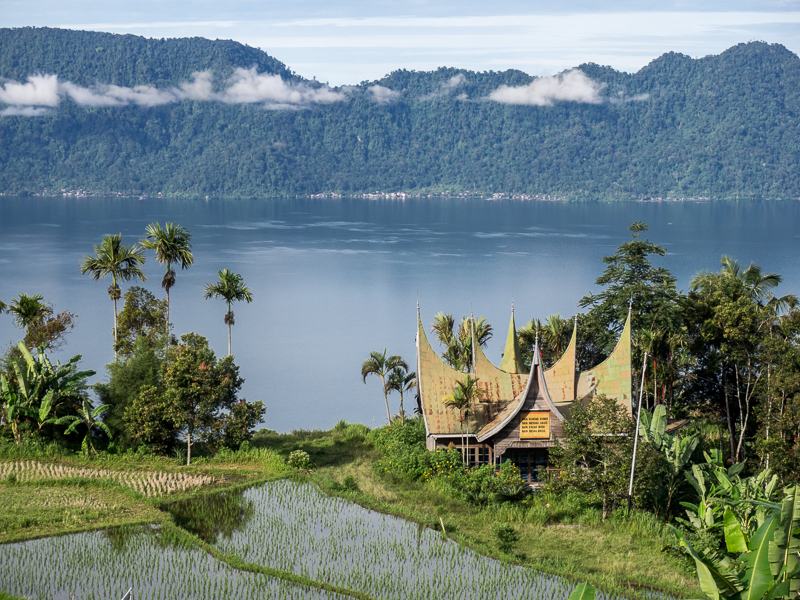 The word Maninjau means 'view over' embedded in a crater of seventeen bij eight km, and surrounded by steep 600 meter high forest covered borders. Danau Maninjau can compare itself with Danau Toba ('Lake Toba'), only it's a bit smaller. On quiet days the surface is almost like a mirror; the lake if full with fish, which shoot up to the surface whenever they think there is something to eat. An ideal space to relax or to enjoy nature. There are nice swimming facilities and paths for walking, hotels, restaurants, boats and even water-skiing is possible. The journey of two hours to the lake is an experience on itself. Take the main road towards the south from Bukitt Tinggi and turn right after five km. 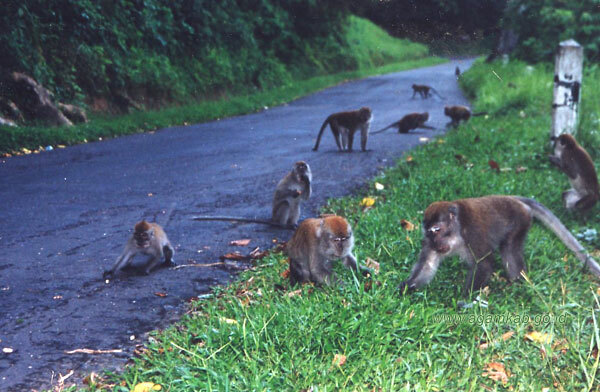 This road runs along the foot of Bukit Kapanasan, through the small city of Matur, then crosses a forested valley and runs from the crater-edge towards Embun Pagi ('Morning Fog'). The view is breathtaking (altitude 1097 metres). Ask the driver to make a photo stop over here. There also is a small hotel. In the early morning small children sell brightly colored handy-crafts of straw. From Embun Pagi the road descends in 44 sharp turns towards the village of Minijau (on 470 meters), at the border of the lake. Puncak Lawang, another, higher viewpoint, is north of Embun Pagi. From here a walking path runs towards the crater edge and the lake near Bayur, a village four km north of Maninjau. 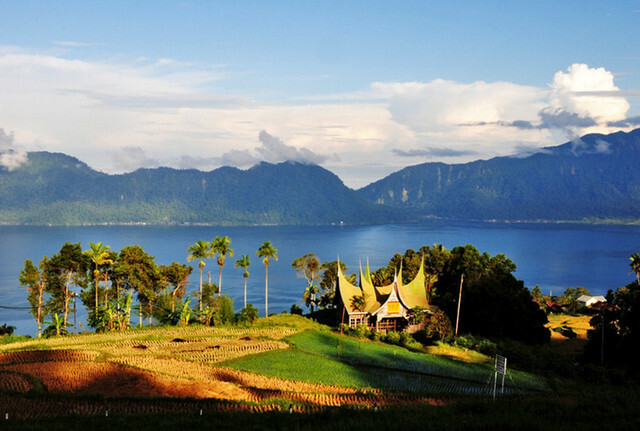 Take for Puncak Lawang the northern route (right) near Matur to the village Lawang, a distance of about five km. A sign points towards the lake on the left side, near the toll gate. Last edited by Lionna; 29-04-2016 at 10:14. I like it very much. I want to go there. All times are GMT +8. The time now is 00:35.